From sketchy records it was determined that about 45 students typically attended Simmons School. Most walked less than two miles to school. One young lady had to walk through the woods to get to school. Stories have it that her father walked her to school the first day blazing a trail so that she would be able to find her way home. A one room school teacher was more often a lady than a man. Besides teaching all eight grades in the school, the teacher was responsible for cleaning and repairing the school. Part of this job included arriving at school early enough to get fires going to warm the school before the students arrived. Teachers were expected to instruct each child at his own level, even if there were no others at his level. Often instruction for a grade level was only five minutes. All students were taught reading, arithmetic, writing, geography, history, orthography (spelling), physiology (health), earth and life science, and usually domestic science (home economics). In doing oral histories, many interesting differences in the school system of the past and the system used today were found. The differences mentioned most often by older citizens was the fact that the attitude of students was quite different in the days of Simmons School. Students took the responsibility of learning all that they could. Success was the learner’s responsibility. Attendance was not very good. This was mainly due to the fact that there was no statewide mandatory attendance of school until 1889, and often older children had to miss school to help on the farm, especially during harvest. Some of the fondest memories among those who attended one room schools was their recess and games. They remembered playing games like Tag, Andy Over, and Cat, which was a form of baseball. Many of the people talked of the playground being divided into a girls’ area and a boys’ area, though this was not always the case. In a one room school, students of all ages and abilities worked together as a family. Older students helped younger students, and more able youngsters tutored those struggling along. Programs and socials involved the total community, and teachers were highly regarded by family members. 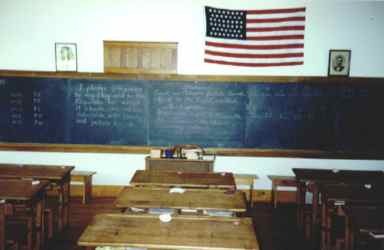 While great strides have been made in education in the areas of technology, psychology, and certainly methodology and content knowledge, there is much from the past that can still be learned and utilized by exposing students to the by-gone era of a one room school.